Allison Hart-Burnett has always been one of my favorite characters in the GIJoe mythos and I’m not entirely certain as to why. 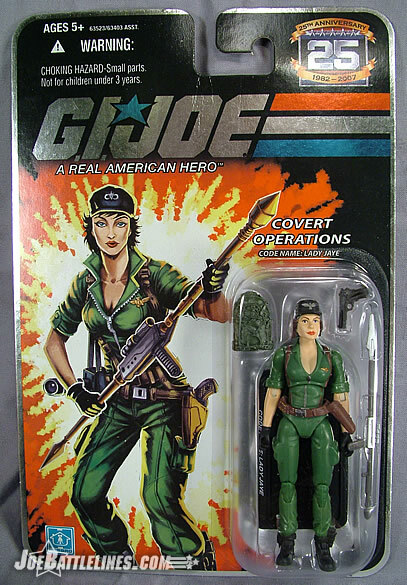 I can still remember watching “GIJoe: The Revenge of Cobra” and thinking that I really NEEDED a figure of this feisty new addition to the team. I can still recall just how peeved I was when Devil’s Due opted to kill her character off simply to reduce Flint to a scruffy Charles Bronson knock-off. 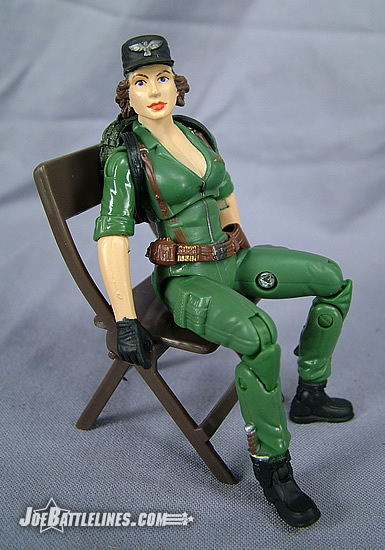 Perhaps her appeal is due to the fact that Lady Jaye is a bit more “down to earth” that Scarlett or that she held her own against some of the most prominent Joes. 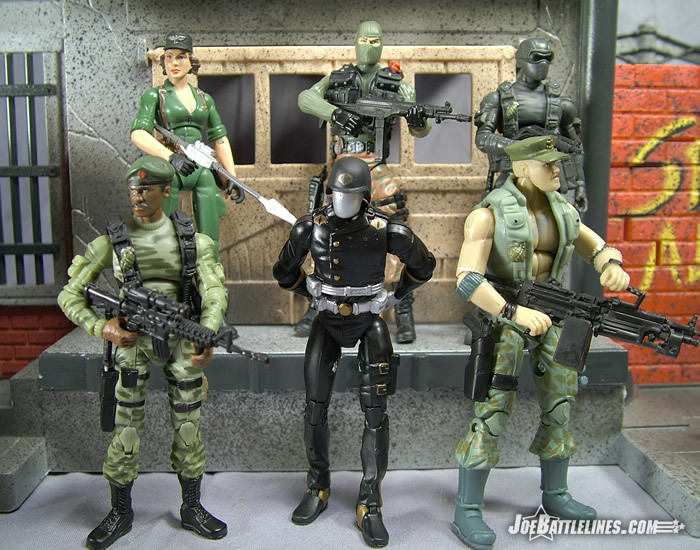 Either way, I wasn’t surprised to see Lady Jaye included among the names to be released in the 25A line. However, after the release of Scarlett I was dubious as to the execution of the figure and this trepidation only increased after the first pictures surfaced on the web. However, seeing a few pics and having the figure “in hand” are two entirely different scenarios. As I said before, when I first saw pics of this figure online I wasn’t all that impressed. Maybe it was the odd-looking neckline or the mid-torso joint but something just didn’t quite mesh together for me. Yet when I look at the figure sitting on my desk in front of me I have a completely different impression. First off, I’m fully convinced that the uniform color seems to be darker in the final release than it was in the prototypes shown in the press images. 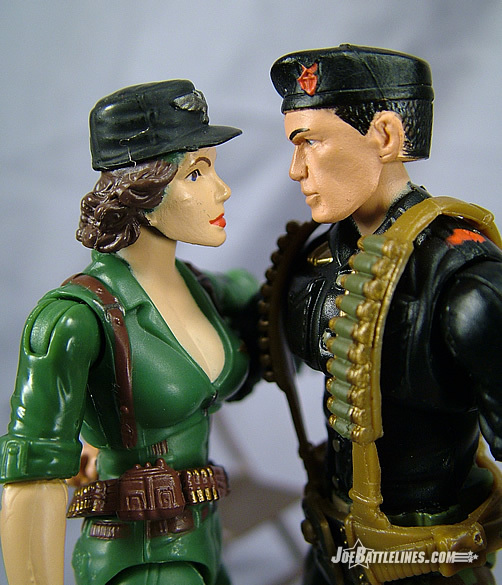 Lady Jaye is wearing a plain dark green jumpsuit with a brown harness and belt, and black gloves and boots. She’s got a gold Ranger badge over her heart and a painted patch on her left sleeve. Her molded cap also includes an eagle silver eagle logo. 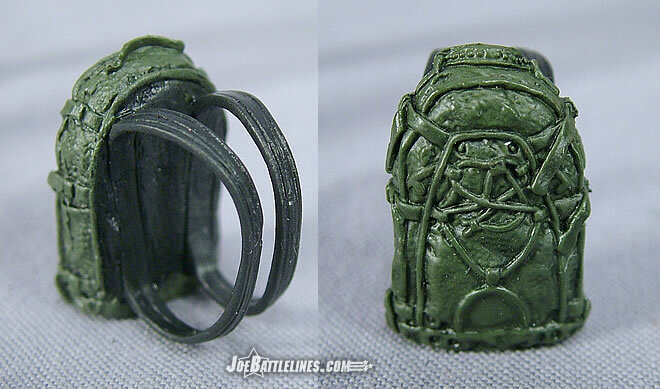 In essence, this is a very basic body mold with a minimum of detailing. Yet closer inspection that the mold isn’t quite as plain and it would initially appear. 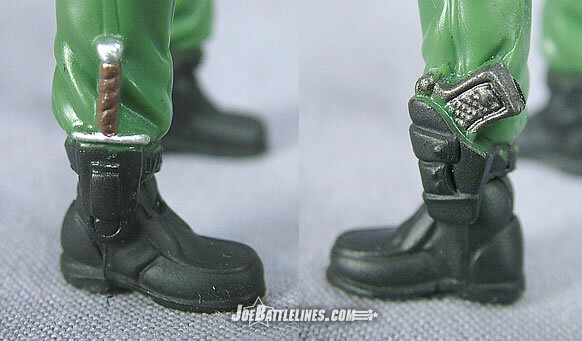 Molded on each ankle is a pair of holstered/sheathed weapons- a knife on the rifle and a small automatic on the left. Just above the tops of her boots are sculpted wrinkles in the fabric—the same detail can be seen just above her rolled shirt sleeves. There is even a small sculpted zipper tab that is painted silver at the bottom of her plunging neckline. (Easy there, fan boy. It’s just plastic.) 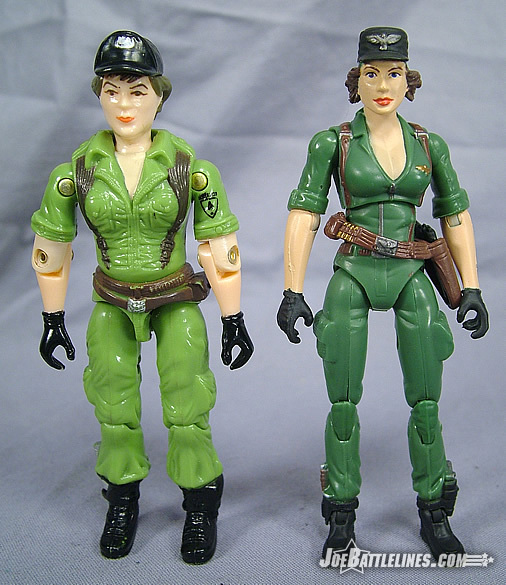 So, all-in-all this is a very faithful recreation of the original Lady Jaye character design and one that is surprisingly proportionate. As I’ve stated multiple times now, the first leaked images of this figure on the web didn’t really do the figure justice. 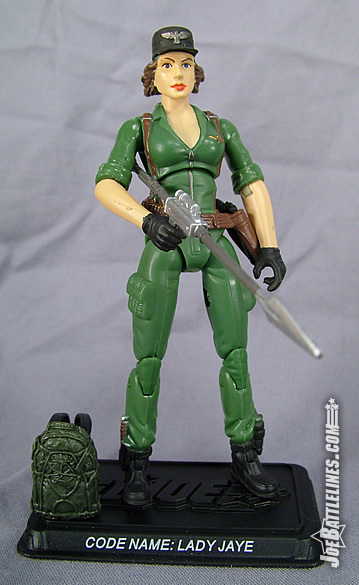 Lady Jaye looked like a spindly anorexic cast-off from “ America’s Next Top Model” with a giant bobble head noggin attached to her diminutive shoulders. The reality is much more pleasing as Lady Jaye actually has a decent head sculpt. While I’ve never been a fan of the sculpted baseball cap look that this figure sports, it is faithful to the original card artwork from the ARAH era which is something that this line strives to emulate. The figure’s hair is nicely sculpted, falling just to the back of her neck and feathering out slightly to the sides. Her eyes are more realistically set than the Battle Pack Scarlett’s which were slightly more animated in appearance. Her nose, unlike the VvV version, is actually present and seems in proper proportion to the rest of her face. If I have any complaints about the head sculpt it’s that the paint applications make it seem wider than it actually is—giving the figures in those initial press images a slightly “bobble headed” look. This isn’t a major issue but rather something that I’ve noticed upon closer scrutiny of the figure and it certainly isn’t going to diminish my enthusiasm for this addition to the line. 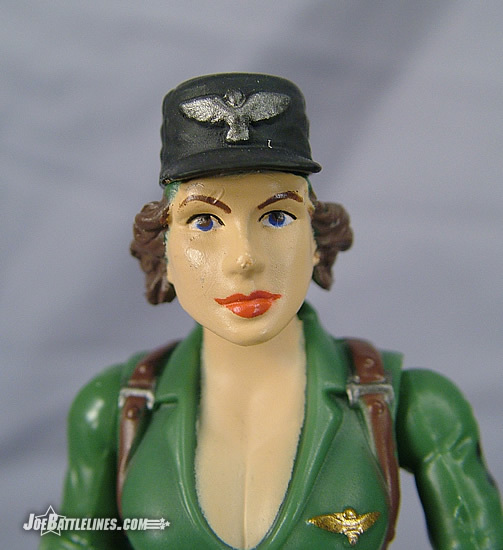 I’m hoping that we might eventually see a “hatless” version of Lady Jaye down the road (comic pack, perhaps) but for now I’m quite happy with this version of one of the Joe team’s premiere female operatives. 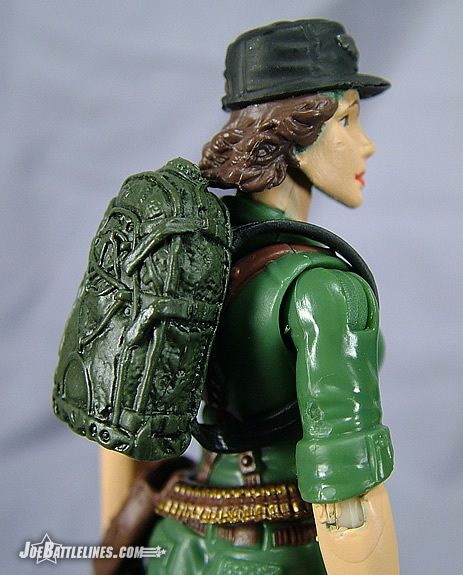 Lady Jaye is equipped with a removable brown belt and holster, a pistol sidearm, and a recreation of her javelin launcher. Personally, I’m not a huge fan of this rifle and will most likely be replacing it with a Marauder Gun-Runners M4 but it is a nice inclusion in the figure’s kit. She also comes equipped with a backpack that does NOT utilize the back post hole the figure has. Instead the pack slips (a bit awkwardly) over the figures shoulders and is held on by two plastic straps. I consider the back pack entirely optional and will most likely not be using it in any of my displays but that is simply a matter of personal preference. 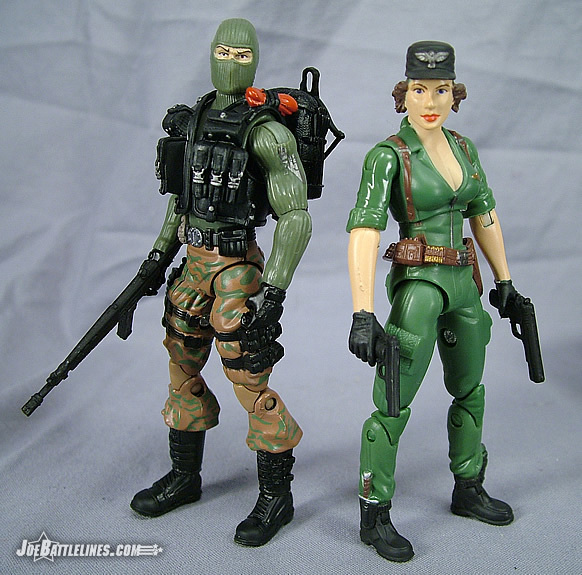 I will say that Lady Jaye is currently the most poseable of the females released in the anniversary line thus far. (Yes, I know that there have only been 3 female figures.) When compared to both the Baroness and Scarlett, Lady Jaye has a great range of motion in her hip joints and also features the double-jointed knees that are becoming the standard across the line. True, she lacks the swivel wrists of the other two females but her increased range of hip motion more than makes up for any limitations that her arms might possess.